This article is about the Australian federal electorate. For other uses, see Electoral district of Brisbane. Division of Brisbane in Queensland, as of the 2019 federal election. 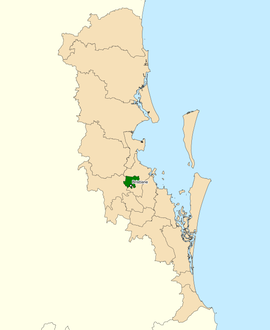 The Division of Brisbane is an Australian electoral division in the state of Queensland. The division was proclaimed in 1900, and was one of the original 65 divisions to be contested at the first federal election. It is named after the city of Brisbane. It was in Labor hands for all but five years from 1931 to 2010, and for most of that time was a marginal Labor seat. However, a redistribution ahead of the 2010 election pushed the seat into more conservative-leaning territory east of Breakfast Creek. This helped Liberal National challenger Teresa Gambaro, previously the member for nearby Petrie from 1996 to 2007, take the seat from longtime Labor incumbent Arch Bevis, marking the first time in over a century that Labor had been in government without holding Brisbane. She was reelected in 2013 with an increased majority. Gambaro did not re-contest the seat at the 2016 election. The contest was historic in that it was the first Australian federal election where both major party candidates in a lower house seat contest were openly gay – Trevor Evans for the Liberal Nationals and Pat O'Neill for Labor. Evans retained the seat for the LNP. On its original boundaries, Brisbane covered all of what is now the northern part of the City of Brisbane, but successive boundary changes cut it back to the inner suburban area. However, between 1913 to 1949 the seat instead covered the inner south-west. It now extends from the city centre into the western suburbs, and includes the Brisbane CBD, Alderley, Ashgrove, Bowen Hills, Clayfield, Enoggera, Ferny Grove, Fortitude Valley, Gaythorne, Grange, Herston, Kelvin Grove, Keperra, Milton, Mitchelton, New Farm, Newmarket, Newstead, Red Hill, Spring Hill, Upper Kedron, Wilston, Windsor, parts of Bardon, Everton Park, Paddington and Stafford. In the 2009 redistribution announced by the Australian Electoral Commission, the suburbs of Hendra, Ascot and Hamilton were included in the seat of Brisbane. ^ Brisbane, QLD, Virtual Tally Room 2016, Australian Electoral Commission.